The latest version of TDS has added new targets using the common dot/diamond/grid design. The target layout and colors have been modified slightly to work with the TDS auto-detection features and still be used to precisely sight-in your rifle. Download the new version of OnTarget TDS. 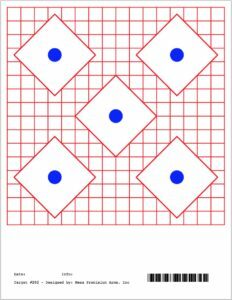 The targets have a blue dot at the center of each aiming point surrounded by a red diamond and grid. Bull size and grid spacing include .5", 1", and .2mil. 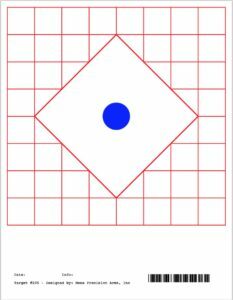 Print the target in color, shoot one shot per bull, scan, and analyze the target to find the bulls and holes. Auto detection works the same as it does with other TDS targets. If you shoot more than one shot per bull, TDS will find the bulls but cannot add in the holes. Use the new "Hole Finder" tool, or add the holes to the group manually. Click these links to view .pdf versions of TDS Target Style 202 and TDS Target Style 205. These new targets were added at the request of the guys at Mesa Precision Arms in Grand Junction, Colorado. They are using TDS to test the precision of each rifle built with several different loads and document the results. Visit the Mesa Precision Arms website to learn more about their company and products.